The Spice Village is situated adjacent to Periyar Wildlife Sanctuary at 190 Kms from Cochin and 145 Kms from Madurai. Would you like to more details of Spice Village? Read here about facilities, services, tariff plans and contact address of Spice Village Hotel. The Spice Village is good quality hotel in Kerala. A wide Range of Indians and an International cuisine are on a buffet system with spices playing an important role in daily menu. The Spice Village is set in the Heart of Cardamom hills in Kerala. Thekkady is the most fascinating pace in Kerala were many tourist spots can be admired by visitors. 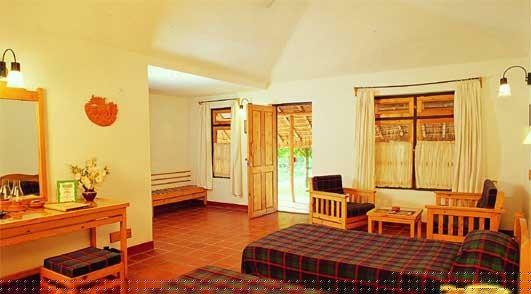 Spice Village is the pretended tourist destination which is offering more nature's gift. The Sanctuary allows visitors to view an elephants, wild boar, deer and other wild animals. Visitors also enjoy the nature's beauty and the singing of birds every small is to be tasted by visitors in Thekady Taj garden Retreat. The Spice Village is mostly liked by many people and it is fully furnished with simple sophistication, terracotta tiled Floors, wooden beds and Chairs, with white washed walls. The Interior and exterior are good enough. Here in Spice Village we can have an Ayurveda therapy in lake view Dining room for families who can chat over there and enjoy for whole night. Spice Village is famous for good quality of spices here. They have 54 Hut Accommodations. Car Hiring is also available for guest to visit some tourist spots around the TSpice Village has a Doctor-on-call facility also available for guests. Currency exchange is also available in Spice Village. The Tariff plans are starts from Rs.7590 for single room and for double room it comes under Rs: 11040 and all rooms are furnished with both A/C and Non A/c Rooms. An Antique decorated room gives us immense pleasure to relax. Persons above 5 years are considered to be adult and full tariff rate is applicable. The Spice Village is got with its natural beauty over the lake and the views are fascinating for everyone who wants to admire Kerala. Here Many facilities are available for guests with moderate cost and guest can experience a pleasure full atmosphere overall in the Spice Village. Overall the views captured here are most memorable and can able to hide it from others. Here they arrange a visit to many tourist spots and The Spice Village is also called as Honeymooners Spot and people will surely like this place if they visit. The atmosphere overall tends every people to come again and again without fail and they are not able to leave the place that much easily. Here there is a Boating in the Famous Periyar wildlife sanctuaries is spotted on either side as you cruise along. The Exotic Mangaladevi temple and Tree and spice plantation visit also arranged here and the Boat safaris are the popular spots here these are some of the sightseeing areas in and around Hotel Tree Top.